The Professional Darts Corporation and ITV have signed a new broadcast contract to continue their coverage of five of the sport's biggest tournaments from 2018-2020. The Masters was introduced to the PDC circuit in 2013 and sees the world's top 16 players competing across one weekend, with Michael van Gerwen having won the title for the past three years. The 32-player European Championship and 64-player Players Championship Finals feature qualifiers from the respective European Tour and Players Championship series' of events. "ITV have been huge supporters of the PDC in recent years and it's fantastic news that they have extended their backing of these five tournaments through to 2020," said PDC Chairman Barry Hearn. "Through these five events, they are showcasing the diversity of top-level darts from the very elite in The Masters to the 'FA Cup of Darts' at the UK Open, where amateur players get to compete against the top names, while the World Series of Darts Finals is a breeding ground for the international stars of the future. "We're hugely excited about the growth of the PDC and professional darts worldwide, and we're delighted that ITV will continue to play a key role in that." The Players Championship Finals in Minehead from November 24-26 concluded ITV4’s 2017 darts coverage, with the 2018 broadcasts to commence from January 26-28 with The Masters in Milton Keynes. 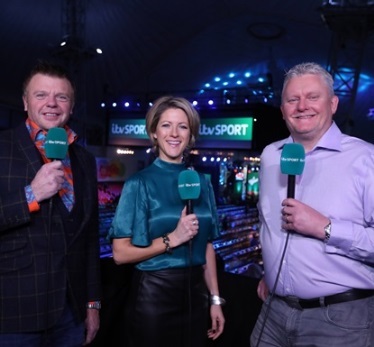 Our picture, courtesy Lawrence Lustig/PDC, shows ITV Sport presenter Jacqui Oatley MBE with experts Chris Mason and Alan Warriner-Little.